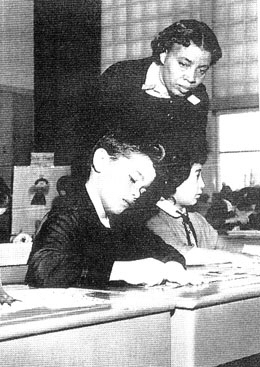 Thelma Dewitty was the first black teacher to be hired by the Seattle Public Schools. She had been a teacher in Corpus Christi, Texas for 14 years and began her Seattle teaching career in September 1947, after intervention on her behalf by the Seattle Urban League, NAACP, the Civic Unity Committee, and Christian Friends for Racial Equality. As a newcomer to Seattle she felt some resentment from black pioneers after her appointment as Seattle schools’ first black teacher. Some of their daughters, she was told, had to leave the state in order to teach because jobs were not available for black teachers. Dewitty’s first assignment was at Cooper Elementary School. She recalled later that the white teachers were told that a black teacher was to join them and anyone feeling uncomfortable about that could transfer. During that first year one parent asked that her child be removed from Ms. Dewitty’s class but the principal rejected the request. Dewitty taught at Sandpoint, John Hay, and Laurelhurst Elementary Schools and retired in 1973, from Meany Junior High School. In the civic arena, she was active in the Seattle Branch of the NAACP, serving as its president in the late 1950s. She served on the State Board Against Discrimination and on the Board of Theatre Supervisors for Seattle and King County.